The highly anticipated Canopy Atlanta Midtown recently announced their new restaurant, Xhibit Studio Kitchen & Bar. 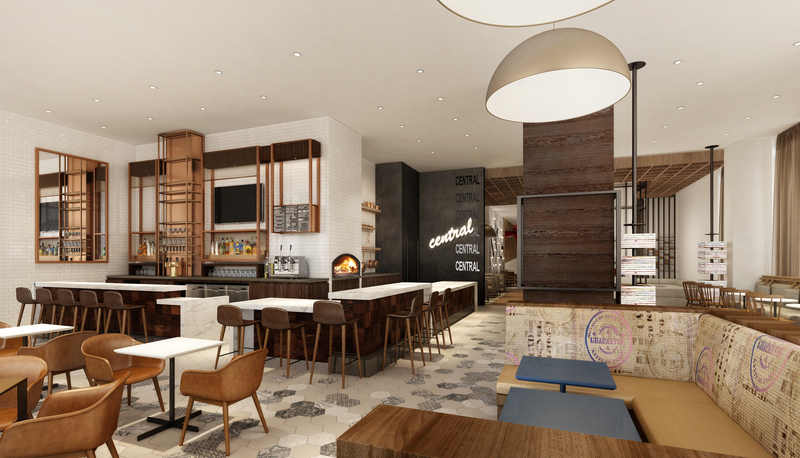 The in-house concept will be led by Lead Culinary Enthusiast Christian Messier and will feature items from local farms and food artisans, served in a modern, stylish setting. Although not yet released, the menu will feature seasonal local picks and will rotate often. It will feature small bites, oven roasted vegetables, and an array of local seafood, dairy, and baked goods. Guests can expect many of the seasonal dishes to be created in the kitchen’s stone hearth oven, one of the main focal points behind the bar. The ornamentation at Xhibit Studio Kitchen & Bar will pay homage to local artists, creators and artisans. Along with a series of stacked canvases by Atlanta-based Emily Mann, ornate tiled floors grace the floor in an effortless pattern, while oversized domed lighting hangs from the ceiling. An L-shaped bar covered in white granite grazes the entrance to the kitchen, while a mix of grandiose booths and chairs make up the rest of the dining room. With vendors such as Rev Coffee, H&F Bread Co., Emily G’s Jam of Love, CalyRoad Creamery, Buckhead Beef, Cheshire Pork, Springer Mountain Farms and the Turnip Truck of Georgia, there is no shortage of capturing the local theme Canopy strives to deliver to each guest. The 3350 SF restaurant space will also serve on-the-go items such as pastries and quiches, as well as function as a coffee bar during the day. Patrons will have the option of in-house artisanal dining, while guests of the hotel can have breakfast delivered to their rooms. Both the hotel and Xhibit Studio Kitchen & Bar will open late 2018. For more information, you can check out the full press release here.